My friends, with the loss of my dad in March many emotions can spring up unpredictably and throw my day into confusion and chaos. Anger is a big emotion. I experience such intense anger at random times it shocks me. Sometimes it feels good…the release, the heightened sense of emotion. Sometimes I hate it and what it does to my outlook and day. I’ve been praying a lot on these erratic outbursts and what they mean, how can I work through them and how to avoid them if possible. I don’t mind grieving because it comes from a place of the deep love I have for my dad but when it threatens to absolutely demolish my work and daily life it must be confronted. This is where yoga, and specifically Power Yoga, comes into play. Being able to focus my breath and thoughts into sustained, uninterrupted movement through these flows is remarkable therapy. Therapy comes in all forms, from enjoying a cup of green tea to hugging on Addie (my favorite! ), and investing yourself fully into a Power Yoga flow for an extended period of time helps to knock the crap out (not literally, though I’ve heard stories) and reenergize my purposes in life as I did in my first video after dad’s passing. I am sure you can relate and I thank you for sharing your own experiences of loss, grief and healing with me through your comments and emails. I love and appreciate you. I explain these thoughts in the intro to this video. 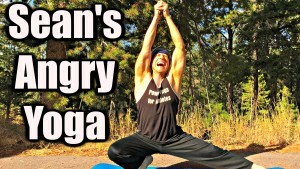 Enjoy, Subscribe and Please Share your Power Yoga experience in the comment section on YouTube! 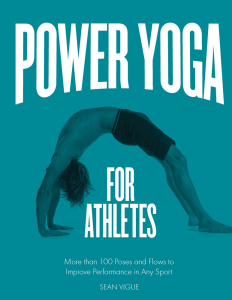 Capture my yoga style my the bestselling book Power Yoga for Athletes! Click the photo below and grab it today off Amazon. I just did this class. I really enjoyed it and will come back to it frequently. I am an endurance athlete and my legs have been very tight lately. I have been experiencing some feelings of depression and anger with nothing I can pinpoint causing it. When I saw the title of this class I felt a strong desire to give it a try. While doing this class I did feel some release. Thank you!! This class will be repeated. I’ve been pissed off for a month. I’ve been sick for that long. I just did your angry class. I only got halfway through the class. I do feel much better knowing my body is coming back to me. I believe I will get through at least 3/4 of the class tomorrow. My friends and invited me to Bermuda for the conclusion to the Americas cup race . I have been kind of worried that I would not be able to travel .I have not been able to do much. You always make me believe in myself. Sorry for your loss. 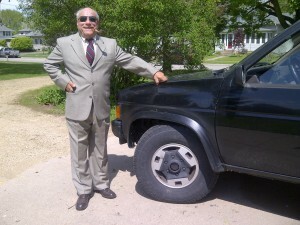 Dad is the most close friends in most of the guys. I’m happy you are able to achieve peace from doing power yoga. We all are suffering from losses from time to time. This power yoga workout is great way to help them. Thank you for sharing with us. It is sad to hear that you lose your dad. As we all are suffering from losses from time to time. Thank you for sharing these kinds of valuable content with us.